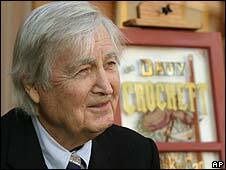 Actor Fess Parker, famous for playing American pioneer Davy Crockett in Walt Disney's classic 1950s TV series, has died in California at the age of 85. The Texas-born actor launched a craze for coonskin caps and buckskin shirts with his sturdy turn as the US icon. 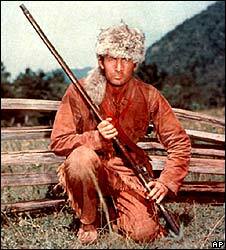 Parker went on to play Daniel Boone, another real-life frontiersman, in a 1960s TV show before retiring. Actor turned California governor Arnold Schwarzenegger paid tribute to him as "a true Hollywood legend". "Fess Parker has been a role model and idol of mine since I first saw him on the big screen," he said in a statement. "As a talented actor and successful businessman, he was an inspirational Californian whose contributions to our state will be remembered forever." Born in Fort Worth and raised in San Angelo, Parker served in the US Navy and graduated from the University of Texas before trying his hand at acting. He subsequently landed a contract with Warner Brothers, making his motion picture debut in Springfield Rifle in 1952. In 1954, at the age of 29, he was cast in a three-episode miniseries about Crockett, the "King of the Wild Frontier" whose life became an American folk legend. The programme was enormously popular with viewers and featured a theme song that topped the charts for 13 weeks. After largely retiring from show business, Parker became a prominent California winemaker and developer. He died of natural causes at his Santa Ynez Valley home on Thursday - the same day Marcella, his wife of 50 years, celebrated her 84th birthday.